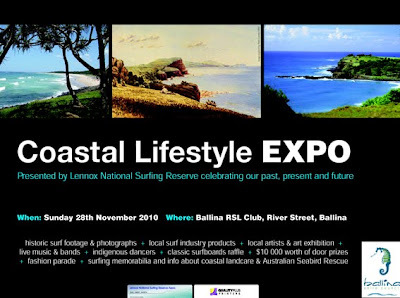 The Inaugural Coastal Lifestyle Expo will be held at the Ballina RSL Club on Sunday, November 28. The event is being organised by the Lennox National Surfing Reserve Association, and it will also offer about $10,000 in prizes, including a trip for two to a Samoan resort. The prize includes airfare and is valued at $5500. The expo will run from 10am until 4pm, and from 7pm will feature live music from Beau Young, Will Conner, Mal and the Longboarders, and Dennis Nattrass, who will play live while footage from film-maker George Greenough is screened. There also will be a fashion parade organised by Le Chelle Boutique of Lennox Head. Archival photographs and footage being collected by the Lennox Surfing Reserve Association also will be on display. Any profits from the expo will be donated to groups such as Australian Seabird Rescue, Landcare, the Ballina jet rescue boat service and youth groups. By attending, patrons will be in the running to win prizes such as the trip to the Sa’Moana Resort Resort in Samoa, surfing-related products and art products. One of the prizes is a 1950s-era wooden toothpick-style surfboard made by Ballina man Barry Regan.